The bull market in stocks since March 2009 has had a fairly simple script too. As a result of the Trauma of 2008, investors have been prone to recurring panic attacks. They feared that something bad was about to happen again, so they sold stocks. When their fears weren’t realized, the selloffs were followed by relief rallies to new cyclical highs and to new record highs since March 28, 2013. Their jitters are understandable given that the S&P 500 plunged 56.8% from October 9, 2007 through March 9, 2009. I have met a lot of institutional investors I call "fully invested bears" who all agree this is going to end badly. Now, they are a bit more relaxed, thinking it won’t end badly anytime soon. Investors have anxiety fatigue. I think it’s because we didn’t go over the fiscal cliff. We haven’t had a significant correction since June of last year. We had the fiscal cliff; they raised taxes; then there was the sequester, and then the latest fiscal impasse. And yet the market is at a record high. Investors have learned that any time you get a sell-off, you want to be a buyer. The trick to this bull market has been to avoid getting thrown off. There was another nasty selloff at the start of 2016 as two Fed officials warned that the FOMC was likely to follow 2015’s one rate hike at the end of that year with four hikes in 2016. I had predicted “one-and-done” for 2015 and again for 2016. Contributing to the selloff in early 2016 was the plunge in the price of oil, which had started on June 20, 2014. That triggered a significant widening in the yield spread between high-yield corporate bonds and the US Treasury 10-year bond yield from 2014’s low of 253 basis points on June 23 to a high of 844 basis points on February 11, 2016. The widening was led by soaring yields of junk bonds issued by oil companies. There were widespread fears that all this could lead to a recession. In addition, the Chinese currency was depreciating amid signs of accelerating capital outflows from China. I remained bullish. 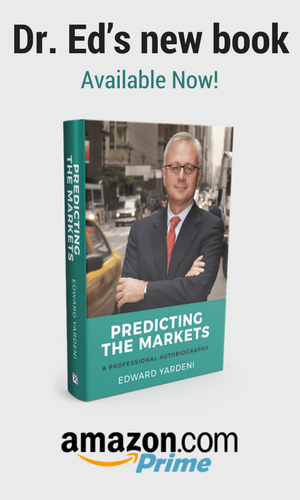 In a February 6, 2016 Barron’s interview titled “Yardeni: No U.S. Recession in Sight,” I reiterated my opinions that the Fed was unlikely to hike the federal funds rate more than once and that the secular bull market remained intact. I argued on Monday, January 25 that “it may be too late to panic” and that the previous “Wednesday’s action might have made capitulation lows in both the stock and oil markets.” Sure enough, the price of a barrel of Brent crude oil did bottom on Wednesday, January 20. The S&P 500 bottomed on February 11, the same day that the high-yield spread peaked. The S&P 500 Energy sector dropped 47.3% from its high on June 23, 2014 to bottom on January 20, 2016. During the summer of 2016, I perceived the end of the energy-led earnings recession and projected that the bull would resume his charge. Following the surprising Brexit vote that summer, the stock market declined for just two days despite lots of gloomy predictions. Just prior to the presidential election, I argued that the rebound in earnings, following the recession in the energy industry, would likely push stock prices higher no matter who won. After Donald Trump did so, I raised my outlook for the S&P 500, expecting that a combination of deregulation and tax cuts would boost earnings. The latest bull market was still going strong in early 2017. It would be a mistake to bet against what President Trump might accomplish on the policy side. I’m giving him the benefit of the doubt, hoping good policies get implemented and bad ones forgotten. We could get substantial tax cuts. All his proposals don’t need to be implemented for the Trump rally to be validated. If you get $1 trillion to $2 trillion coming back from overseas because of a lower tax on repatriated corporate earnings, that would be very powerful in terms of keeping the market up. So far, investors are relieved that the bad outcomes predicted by the naysayers about Trump in the White House haven’t happened. The anticipated bullish outcomes are also still mostly on-the-come. Nothing really terrible or wonderful is happening other than that earnings are rising in record-high territory again. By the way, in case you missed it, you might be relieved to know that Greece and its international creditors on Tuesday reached a preliminary deal allowing the country to receive yet another round of bailout payments in exchange for promises to raise taxes and to further cut pensions and social spending. Chinese stocks seem to be stabilizing this week, having dropped sharply during the second half of April after officials slammed what they called short-term speculators. This past Sunday evening, congressional leaders reached an agreement on a spending deal that would fund the government through the end of September and avoid a looming shutdown. This weekend, the French are likely to elect a President who is all for the EU and euro. These developments should all be a relief, though no one really worried much about any of them this time. Nothing bad is happening, which is good news for stocks.